This red and blue mask was for a two to five year old child. It dates from World War II when the British government gave everyone in Britain a gas mask as protection against possible poison gas attacks by the Germans. This mask was known as the 'Mickey Mouse' mask even though it doesn't look anything like the cartoon mouse! 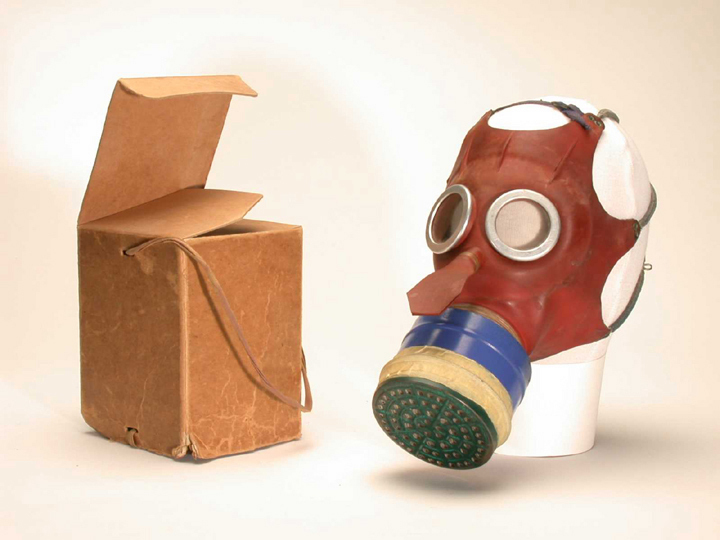 Because many small children were frightened of gas masks, bright colours and the friendly name were used. The lower part of the gas mask is the filter. This is a blue tin can with perforated holes. The can holds a block of asbestos, a chemical substance that absorbs poisonous gases. Children would breathe the clean air into their mouths, and then breathe out through the rubber flap. Children learned to annoy their parents by making a 'raspberry' noise every time they breathed out. As asbestos ages it breaks down. We now know that there is a link between asbestos and lung disease so it is very important that all asbestos is professionally removed from old gas masks. The British government took precautions against poison gas attacks and by 1938 they had issued 'civilian type respirators' to every man, woman and child in the nation. There were versions for animals, too. Over 40 million gas masks were issued. There was an American gas mask for children that looked like Mickey Mouse, with the character's nose and ears and even a picture of him on the gas filter. Walt Disney helped in its design. The British 'Mickey Mouse' mask did not resemble the character but it used the red and blue, like the American version, and kept the name.